Last minute reservations never disappoint at 1922 Starkey House Bed and Breakfast Inn. May is especially beautiful here, along deep blue Seneca Lake just north of Watkins Glen. Guest reviews have been consistently good through the winter and early spring months. The vineyards are getting ready for leaf formation and the wineries are already bustling on the weekends serving last year's harvest and reserve vintages. We are located within five miles of Glenora Wine Cellars, Starkey's Lookout, and Magnus Ridge wineries. Our central location allows guests to visit any of the area's nostalgic spots of interest within thirty minutes or less. Last minute reservations for any of five rooms, that include a packet of wine tasting passes to local wineries call or E-mail cathy@1922starkeyhouse.com . Month of May specials will include booking two or more weeknights (Sunday to Thursday) for 10% off. Watkins Glen at the south end of Seneca Lake, has a downtown market area and quite a few great restaurants, the newest being Nickle's Pit BBQ that features micro brews from Rooster Fish Brewing Company. Hammondsport is located right at the south tip of Keuka Lake and is a lovely village to walk and explore antique shops, gift shops, art exhibits, and offers a variety of eateries such as the Keuka Artisan Bakery & Deli. 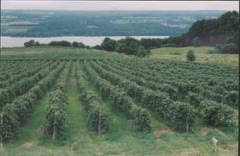 Come to visit to see and taste all that the Finger Lakes region has to offer! Waterfalls, museums, wineries, fishing, boating, festivals, antiques, art, music and great places to eat!